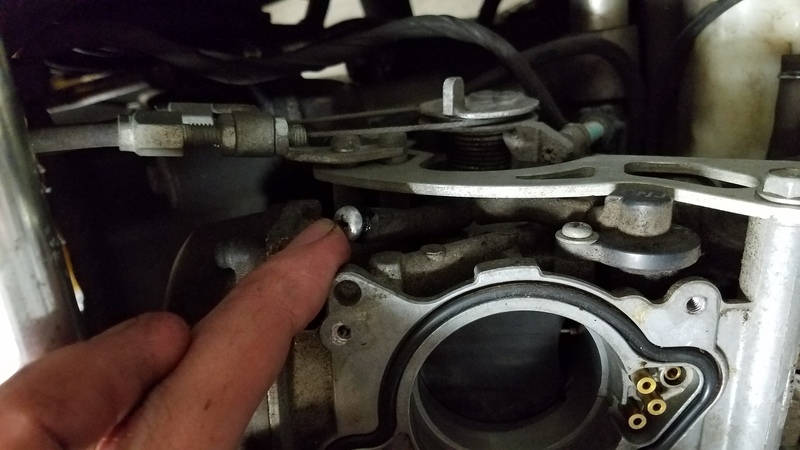 Ive been having some really crappy low throttle cruising on the hawk so i decided to yank the carbs off and see whats in there from the PO. Also when im at maybe 3-4k and hit it, it bogs and doesnt really speed up. Ive had old 600cc bikes that were faster. Im sure something with the carbs is up. What I see is a stock Honda air filter, 45 pilots and 175 front and 178 rear jets. 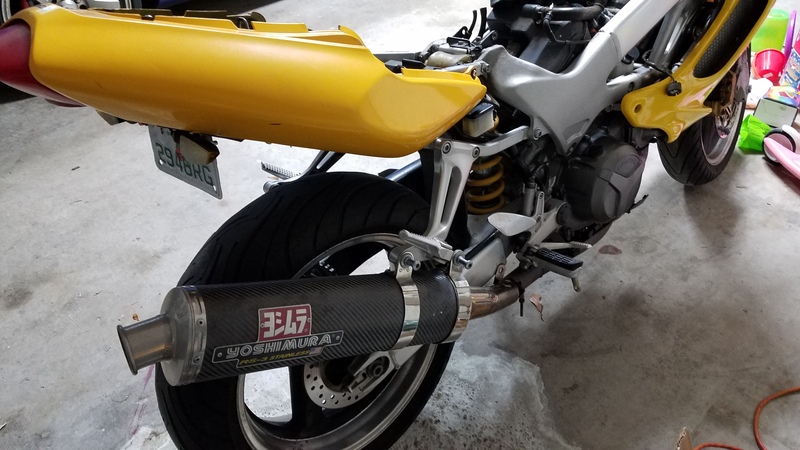 I have a SINGLE yoshi exhaust on the bike. Does any of this seem amiss? 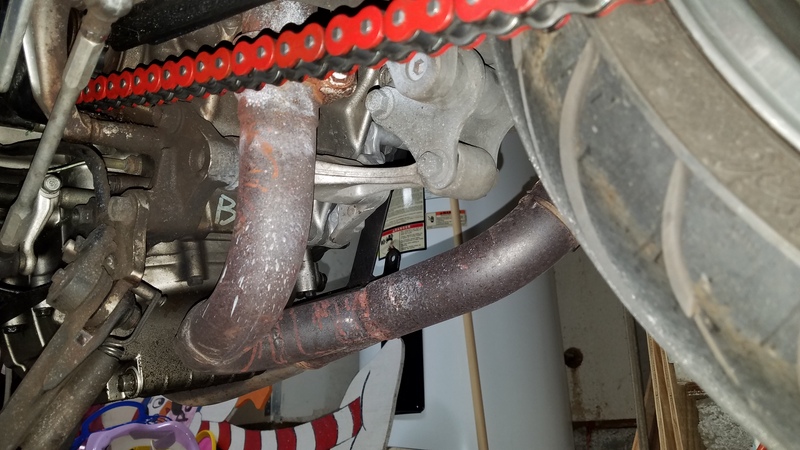 I should also note that my front choke fitting was busted and hanging out. Would this be the source of all my running issues? Where can I get that little plastic bugger from? That broken choke (enrichner) fitting is a common problem with our bikes. It is most likely the majority of your running problem. Use "search" of this forum as there is a fellow member that makes brass replacement for a very fair price. If he is currently out, I may have an extra set I'll ship you, cheap. Sorry mate, I'm old. His member name is Jack Flash. Search Choke Fittings he'll set you up. Sounds like a plan. Once the funds swing in favor of fixing the bike during the winter ill contact him, they look sweet! I'll look around my shop today. If I find my extras, I'll send 'em to you. Just Pay It Forward. Wow that would be wonderful news! 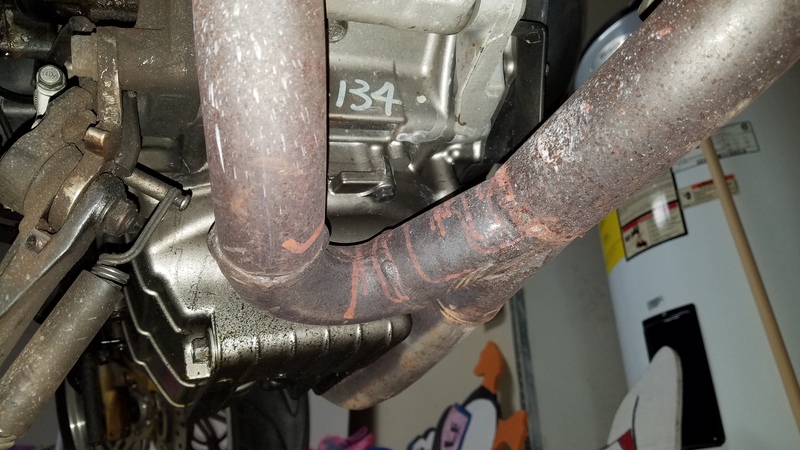 Here are some pics of other "mods" that ive found under the tank. One of the carb screws was missing I suppose, so they put a good old socket head in there without a washer. 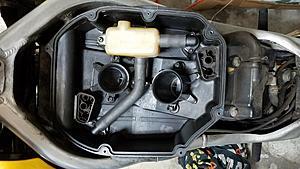 Also missing the foam in the airbox. Lastly not sure why there is a screw in that vac hose? Should that be going somewhere other than the bottom side of a screw? that vac hose that has the screw in it? is that not one of the vent hoses thats meant to vent to air?. also you said you had a single yosh can? is your bike running a 2 into 1 system? if it is junk it and put twin pipes on it as you seem to be running standard jetting, also ib be changing the pilots upto 48s. Not sure, I can take a better picture. 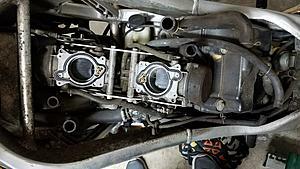 Its on the front carb. HAHA sure if I had stock pipes they would be on there trust me. I dont have money to blow on this bike so single Yoshi is staying. Why change to 48s when the bike idles great right now? I think the vac line with the screw in it may be the line that used to go to the PAIRS solenoid. The 48's just smooth out the transition from idle to lower throttle opening. They also ad a little "pep" throughout. Can you post a picture of you Yosh system? The sub filters Part # 17254MBB00 are available for about$1.55 ea. The cap screw will work, just put a bloody washer on it. 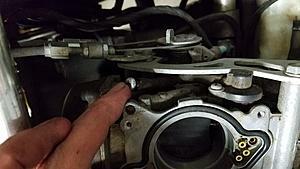 If you happen to drop one of those little screws and it falls through the gap between the carb body and the slide. Do Not, I repeat, Do Not twist the throttle. Just slide the slide up and retrieve the errant screw with a magnet. Unless, of course it's monel stainless. Then you'll have to retrieve it from the butterfly with tweezers or the like. 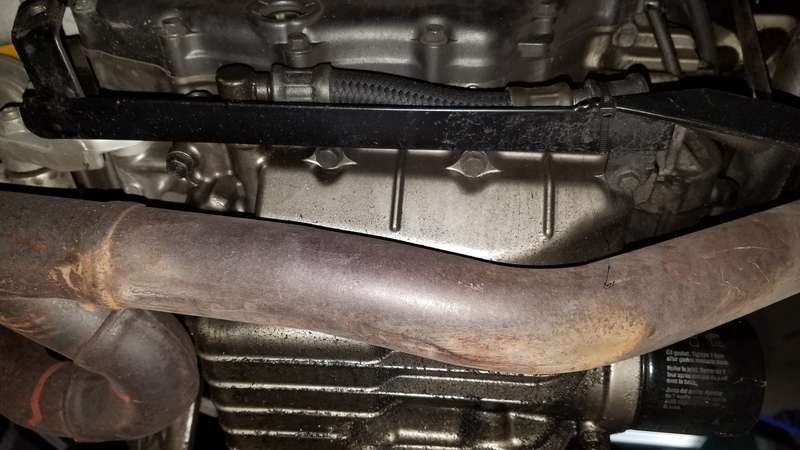 If you open the throttle it will go down the intake port! Even then, it can be retrieved. Don't ask how I came to know this. 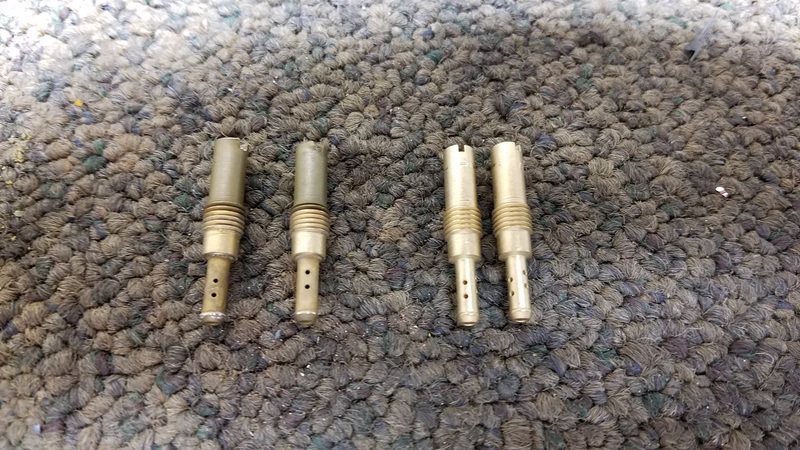 I recently replaced the undamaged plastic enrichment fittings with the Jack Flash brass pieces. If you want them I'll send them to you, that is if CaryDG can't find his. I cannot thank you all enough. Really, Ive been on many forums over the years and you all are always so helpful and supportive! Were can I pickup the 48 idle jets? No worries about the screw drop. I had something like that happen when I had a Katana. Wont make that mistake again. Here is a picture of the Yohi can that was on the bike when I bought it. Sounds ok but id love a dual setup. I found my extra "Jack Flash" choke cable fittings. They are bullet proof!. PM me your address and I'll get them in the mail to you ASAP. is your Yosh system a full system? Header, collector, etc.? 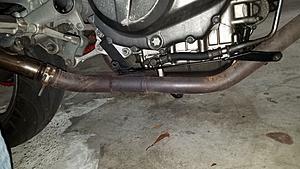 Is it possible to take a picture of the pipe/collector itself? We might be able to work some trades. 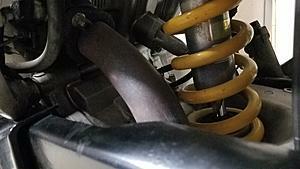 I'm looking for the right system for my project bike. The right single can system may be just the ticket. PM sent! Thanks again so so much! Here are some more pictures I took this morning. Yea I dont know why the PO put a single can on there. If I had duals then they would be on there. Got the bits and bobs ordered. Got all the misc missing and "replaced" screws set right with proper stock bolts and what not. 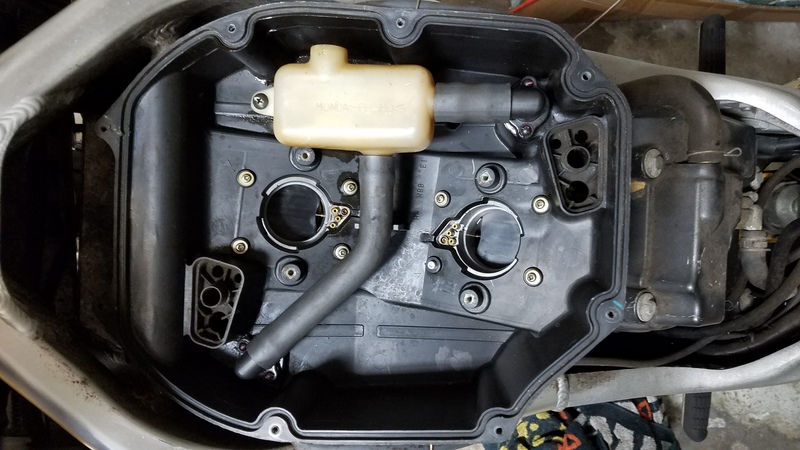 Also got the small foam filters and the other port required to sync the carbs for once. Also got some 48 pilots coming in to try out. Just waiting on the parts from CaryDG and hopefully in a week or so I should be able to ride again! Change your ccts to manual ones brother. Won't matter how well it rides if you blow it up. Getting there. Its fairly expensive at the moment. Heck I could make one at the machine shop at work I bet. I am a designer by trade. Got the 48 slow jets in and installed. 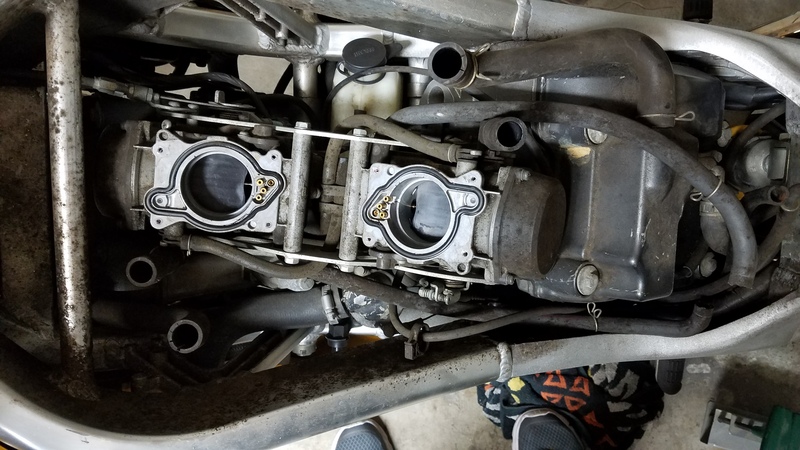 Also filled the carbs with gas to make sure I got a good seal on the bowl gaskets. Waiting on the screws and such. Should be here Thursday and I might actually get a ride! Since I havent got the parts from CaryDG im just going to glue the broken one for testing and wait for them to come in.